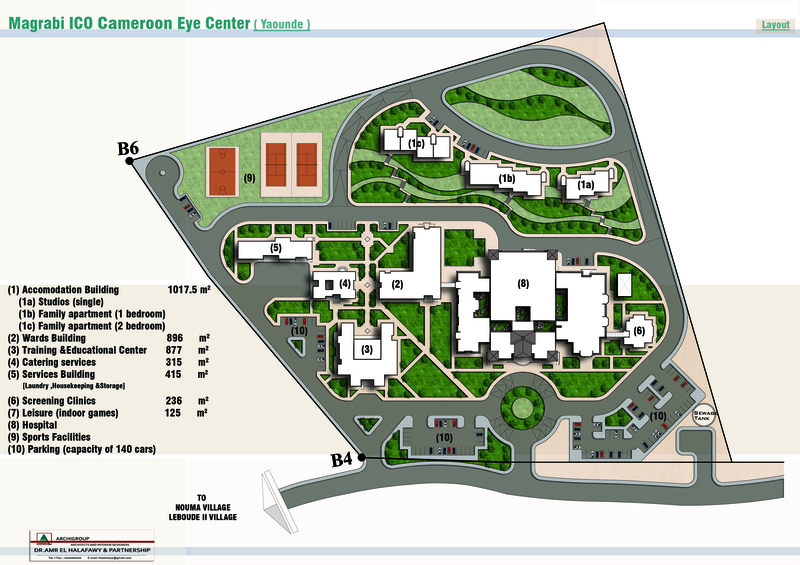 The proposed layout of Magrabi ICO Cameroon Eye Institute reflects its objectives well. 1. To serve as a tertiary level eye referral center, not just for Cameroon also but for neighboring countries. 2. To offer ophthalmology subspecialties capable of handling complex retinal surgeries, pediatric eye surgeries, glaucoma, integrated management of diabetes and diabetic eye complications, cataract and refractive surgery, ocular plastic surgeries etc. 3. To serve as a training center for ophthalmologists, optometrists, ophthalmic nurses and other ophthalmic and managerial specialists for Cameroon and neighboring countries. 4. To offer laser vision correction services (Lasik, Lasek etc.) using the most modern laser technologies. 5. To offer laser treatments for diabetic retinopathy, glaucoma, retinal detachments etc. using state of the art laser technologies. 6. To include a strong community eye care component, which will ensure that the technology and know how does not only benefit the inhabitants of Yaounde, but also the poor living in rural areas. By the time Magrabi ICO Cameroon Eye Insitute is fully operational, construction of state of the art accommodation to host, not just visiting faculty comprised of international experts in the various ophthalmic, public health and managerial specialties, but also trainees from various countries across Africa would have been completed. The goal would be to contribute in a sustainable manner in rolling back avoidable blindness and loss of vision, not only in Cameroon but also and most especially in countries of francophone Central Africa. All this in a very pleasant environment for patients, trainees, staff and faculty. This entry was posted in Africa, Blindness, Cameroon, Cameroon Eye Institute, Cameroun, Chirurgie Refractive, Diabete, Diabetes, Diabetic Retinopathy, Eye Clinic, Refractive Surgery and tagged Cameroon, cataract, Central Africa, Clinic Ophtalmologique, clinique, Diabete, Diabetes, Diabetic Retinopathy, Eye Clinic, Eye MD, glaucoma, lasek, laser, laser vision correction, lasik, ophthalmologist, Optometrist, Paediatric Eye, refractive surgery, retinopathy diabetic, Yaounde. Bookmark the permalink.